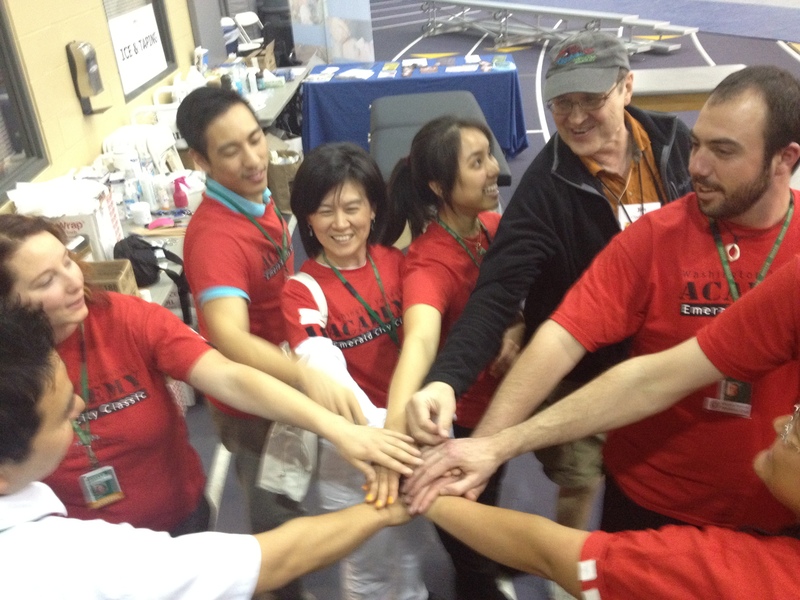 The ECCI (Emerald City Classic Invitational) volleyball tournament was my first preceptorship experience. I found out about the event a year ago after joining BSMC (Bastyr’s Sports Medicine Club), and because I play a lot of volleyball myself, decided to accompany the BSMC. Last year, because of class scheduling conflicts with taping training, I didn’t have the proper skills to do much else besides the honored tasks of running errands, wiping tables and bagging ice, not to mention the fact that I was the only first-year student there, but even so, I was glad to be a part of the team. I did learn a few things from my time there as I observed the upperclassmen and Dr. Takakura at work, and I gained my first true patient encounters interacting with the players and their parents. This year, after having a little more practice and knowledge under my belt, Dr. Takakura suggested that I essentially shadow and learn from one of the most experienced upperclassmen present while I was at the tournament. Dr. Takakura was very observant, even with all that was happening simultaneously, where he would personally walk over and instruct that I take part in the hands-on assessment and treatment of the injured players. It’s amazing how much more you learn when you combine observation together with hands-on experience. Under the patient guidance of my temporary mentor, she taught me the barrage of essential questions to ask in regards to different injuries, the keys to assessing the severity and pinpoint location of injuries, and the beginnings of the principles behind the Kinesio taping method. What I really enjoyed about this second time around at the ECCI was that I could put into practice some of the treatment techniques I learned in the hydrotherapy/physiotherapy, myofascial analysis and manipulation I courses as well as from anatomy. It was rewarding to finally be able to pseudo-treat “patients” and realize that I could assimilate key components from my courses to formulate a simple treatment plan, only after consulting with an upperclassman and/or Dr. Takakura of course. It felt good and reassuring to actually know something about an injury and have an idea of how to address it. Not only was this a highly beneficial event from an educational perspective, but the ECCI also brought back great memories for me and gave me a stronger desire to be there all the more. Volleyball holds a very special and permanent place in my heart because of all the years I spent playing indoor, grass and beach since my teens. And watching the high school girls compete took me back to the highlights of my old high school days. All in all it was an absolutely fantastic experience from simply getting to know the awesome upperclassmen better to assisting Dr. Takakura in Kinesio taping, even though, to be honest, it was a little stressful at times. The most important thing I learned in my 21.5 hours spent at the event was that Dr. Takakura doesn’t want the bun with his hot dog but loves vegetables, onions especially, and highly prefers mayonnaise with all that. But seriously, what I gained most out of this experience was the affirmation that what I’m here to study at Bastyr University is truly what resonates within my entire being. Not only that, but I know for certain now that wherever I end up, physical medicine and sports medicine will always be an integral part of my future private practice as a Naturopathic Doctor. 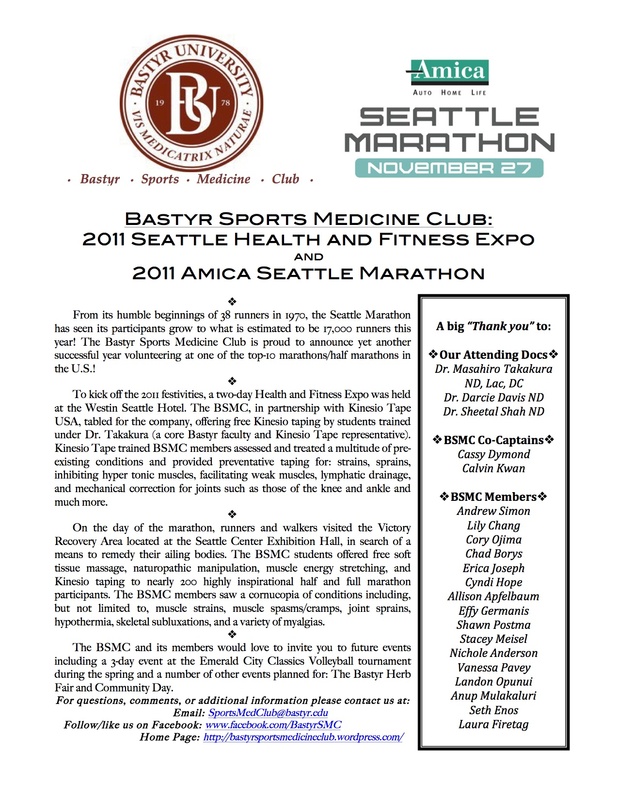 Here is our summary of the Seattle Marathon 2011! Thanks Calvin for writing this up! Thanks to all of the Bastyr Volunteers for helping out!